Bangkok's main international airport is located about 30 km to the east of the old city. The airport is called Suvarnabhumi and is prounounced 'Sir-varn-a-boo'. It's international code is BKK. The name Suvarnabhumi refers to the golden kingdom that appears in some ancient manuscripts. Suvarnabhumi has the third largest airport terminal in the world after Beijing's Terminal Three and Hong Kong's Chek Lap Kok. At 132.2 meters, Suvarnabhumi's control tower is the tallest in the world. 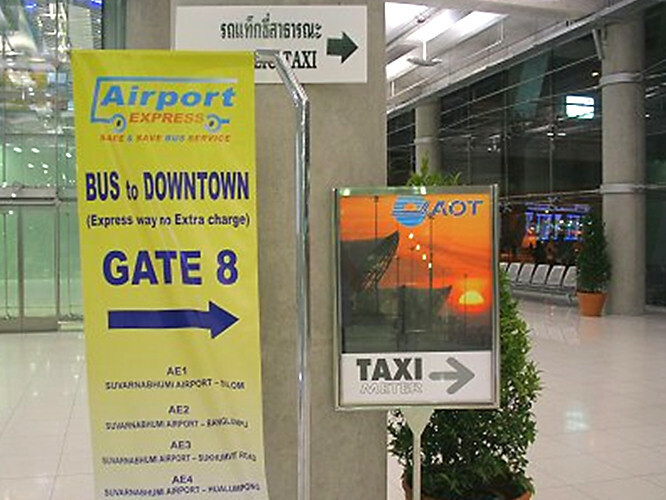 For passengers arriving at Suvarnabhumi Airport, there are three main transport options to get into Bangkok city. 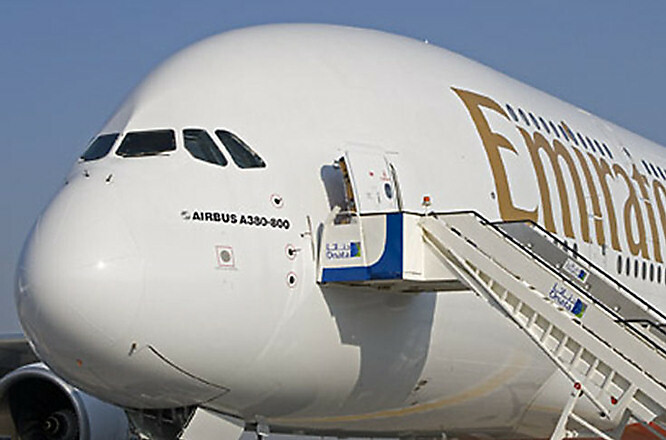 It is a new airport it began full domestic and international flights on 28 September 2006. There are oriental architectural reminders that your are in Thailand interspersed in the modern steel and glass design. The type of vehicles used for metered taxis in Thailand are not fit for purpose. They are too small. The car boot cannot even accommodate one large suitcase. They have to use rope to keep the top of the trunk down whilst your suitcase is in the boot. Your other suitcase has to go on the front seat. That only leaves room for two passengers in the back. If there are four of you in your group you need to hire two taxis. The prices is only 300 Bht. Make sure that the driver turns on the meter before you start. Most do. We only had one driver who tried it on. He said he would do the airport run for 400 Bht. We insisted he put on the meter. He was not happy so he did not get a tip at the end of the trip. He should not try and have the tourist over. When you leave the customs at Suvarnabhumi airport exit the terminal building on the 2nd floor. Look for the taxi stand and then join the queue of passengers waiting to board the taxi. There is usually a continuous stream of taxis, so you usually do not have to wait very long for your turn. If you are travelling to Bangkok, you need to pay the metered taxi fare, plus a 50 baht surcharge and any expressway tolls. The total usually comes to about 300 baht. Depending on traffic conditions I have paid anywhere between 240 baht to 360 baht. 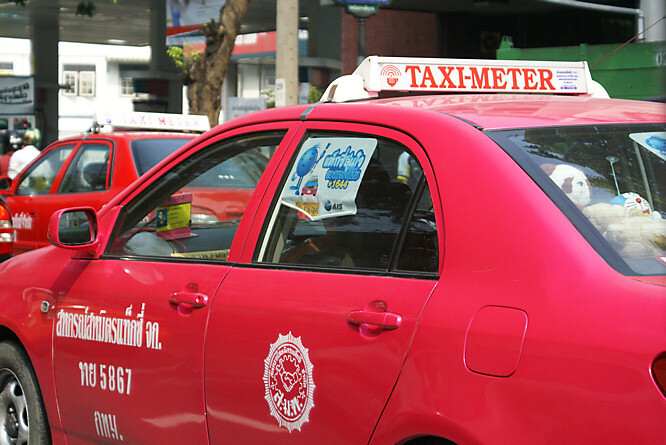 If you are travelling to a destination outside Bangkok, ask the taxi driver for the charter rates. Beware of taxi touts who try to entice you to their taxi. Just ignore them and head for the 2nd floor official taxi stand. I ignore their calls of 'Very cheap, only 500 baht!' They are looking to con tourist who do not know the correct price of a journey to Bangkok. Do not fall for their trick. Leaving Bangkok from Suvarnabhumi - To get to Suvarnabhumi Airport from Bangkok, hail a taxi. All the metered taxis should be able to take you there, and the journey doesn't require you to pay the 50 baht airport surcharge. Be sure to allow sufficient time and avoid rush hour, which should more accurately be known as crawl hour or stationary hour. Usually, the expressways are not jammed, but the roads leading to them are. Hence, you may get stuck on the same road for half an hour, moving less than 200 meters. There are large Limousine Taxis located on the 2nd floor. They charge about 800 baht for the same journey. It there are four of you in your group it is still cheaper to hire two metered taxis. The Airport Express Buses charge a flat rate of about 150 baht per person. They operate from 7:00am until midnight. The buses are air-conditioned with ample luggage space. Passengers can get on the bus on the first floor of the termin. The main disadvantage with the Airport Express Bus is that they will not take you direct to your hotel. If there are more than two of you, a 300 baht taxi is the best option. You get door-to-door service for the same price with the taxi. There are four routes. Each take between 60-90 minutes. The Airport Express Buss 1 (AE1) goes from Suvarnabhumi airport to Silom in Bangkok. The Airport Express Buss 2 (AE2) goes from Suvarnabhumi airport to Khao San Road in Bangkok. The Airport Express Buss 3 (AE3) goes from Suvarnabhumi airport to Sukhumvit in Bangkok. The Airport Express Buss 4 (AE4) goes from Suvarnabhumi airport to Victoria Monument-Hua Lamphong in Bangkok. The airport express train services to Suvarnabhumi international Bangkok airport informally known as the Pink Line is 28.6 kilometres long and is elevated for most its length. Both non-stop Suvarnabhumi Airport Express services and the 'stopping' commuter service Suvarnabhumi Airport City Line will be operated, with express journeys taking 15 minutes and commuter trips 27 minutes. My name is Craig Moore and I love traveling. I hope you enjoy my travel tips and find them useful.